The new MAJESTIC makes no compromises. Wells Audio builds the very best sounding audio equipment in the world, despite cost or design limitations. The Majestic may be the best example of that philosophy to date. 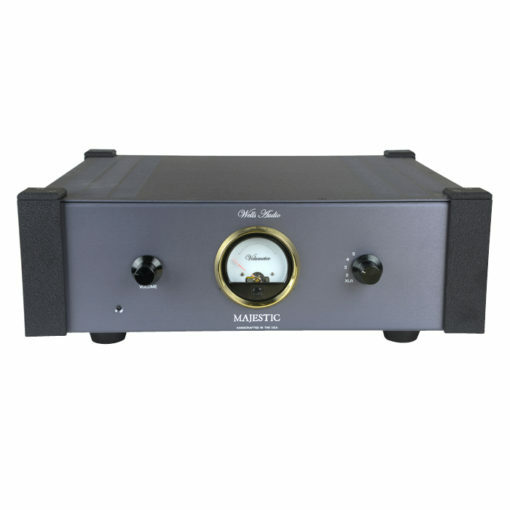 At a robust 150 watts into 8 ohms and vanishingly low distortion and noise levels, the Majestic embodies the full, quiet, detailed, sweet and rich sound that is the hallmark of our success. We believe that the Majestic is not only the best performing integrated amplifier at or near its price point on the market, but that it competes with some of the best and expensive equipment in the world. The Majestic features 5 inputs (one pair XLR), a beautiful volumeter, and a remote control for muting or adjusting your volume. It’s well-equipped, but is designed more like a Bowie knife than a Swiss army knife–sleek and functional. The Majestic is that rare integrated amplifier that can take its place at the heart of a truly high-end audio system, but do it without giving up the necessary power and performance that is the case with most integrated amps.